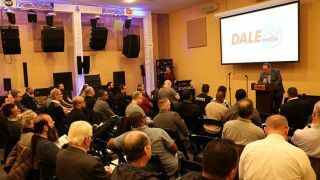 Dale Pro Audio hosted its inaugural Networked Audio Event at its Jamaica Queens, NY headquarters on March 24, 2017. Audio networking is among the most talked-about topics in the industry, and the event featured informative overviews of Audinate's Dante and other technologies, as well as real-world case studies provided by keynote speakers. Dale’s Joe Prout, who served as master of ceremonies for the inaugural event, addressing attendees. Co-sponsored in part by Ashly, Audio-Technica, Clear-Com, Focusrite, Mackie, Soundtube, Stewart Audio, and Symetrix, the summit attracted more than 50 attendees from various parts of the pro audio industry, including integrators, engineers, and industry representatives. "We were happy to educate our valued customers on the latest technologies, and hopefully de-mystify networked audio and show them how to integrate this solution into their signal chains,” said Joel Guilbert, Dale’s technology development manager and the originator of the event. Symetrix’s Jim Latimer demonstrating the SymNet system during the event. .Highlights of the event included appearances by Joe Shalhoup and Dave O'Brien of NBC News, who gave an in-depth overview of how they used the Dante audio format to set up their network's broadcasts such as Meet the Press, the 2016 Democratic National Convention, and the 2017 Presidential Inauguration. Other presenters offered solutions, tips, and insight into microphone and mixing solutions that feature networking capability. The event was streamed live on Dale's Facebook page, where more than 1,500 people tuned in to watch. "We can't stress enough the importance of being on the cutting edge in our markets, and I'm elated we had such a fulfilling and engaging event that reinforces our position as a leader in this exciting field,” said Dale's co-owner, Valerie Lager.